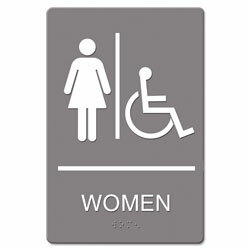 Easily recognizable graphics indicate a wheelchair accessible Women\`s restroom. Raised tactile graphics with grade 2 braille. Meets Americans with Disabilities Act (ADA) requirements. Paper Type: N\A; Paper Color(s): N\A; Sign Type: Restroom; Width : 6 in. Signs, Letters and Message Boards from Quartet! 162 In Stock today.